As implementation of Dodd-Frank takes effect, the Federal Reserve Board shed light regarding the implementation of the customary and reasonable fee provision of the legislation. The Federal Reserve Board, tasked with implementing the landmark Dodd-Frank Financial Reform legislation passed last year, laid out its guidance in the “Interim Final Rule” (IFR) published in October 2010 (find it at WorkingRE.com, Sidebar: Interim Final Rule, 2010). Since then, appraisers have been struggling to understand how the customary and reasonable fee directive will be enforced. Authors of Dodd-Frank clearly and specifically include language guaranteeing “customary and reasonable fees” for appraisers as a vital element for assuring appraisal quality. How this will be accomplished, however, remains murky. To date, appraisers have reported a few instances of appraisal management companies (AMCs) raising fees- for whatever reason. In general, appraisers report a disparity of fees paid- some fairer than others, depending on the AMC and various market factors. Some appraisers say certain AMCs have always paid “fairly,” though what is “fair” is a contentious issue among appraisers. The Board, in the IFR, addresses the customary and reasonable fee directive by providing two distinct presumptions of compliance, saying that AMCs, lenders and others can meet the customary and reasonable fee standard by satisfying either presumption, without having to meet both. 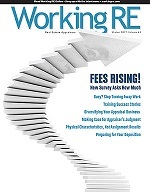 The first presumption outlines “customary,” which seems to mean “recent” or the current fees paid to appraisers by AMCs; the status quo in other words. The second presumption, which outlines “reasonable,” calls for the use of independent fee studies which specifically exclude fees paid by AMCs. So not only do the two presumptions of compliance contradict each other, by making compliance customary or reasonable, but by enabling the status quo, the spirit of Dodd-Frank is missed. This is where we are until recently.